You are here: Home / Family / Education / How to Raise a Reader – with FREE Books! How to Raise a Reader – with FREE Books! Do you like to read? We sure do! It’s one of our favorite guilty pleasures, as mamas. We don’t always get the time to ourselves to read a good book, but when we do, it’s magic. Even if you don’t really enjoy reading, there’s no denying how important it is in our society. From grade school to successful adult, reading is a part of your entire life. Which is why it can’t be understated – learning to read is vital for your child to become an intelligent, creative, and successful person. Reading exercises the brain, increases a child’s concentration, and improves a child’s vocabulary, communication, and language skills! Plus, books teach valuable lessons. Your child can learn about history, science, morals and values, and the world in which they live. Reading can teach your child empathy. They’re given the unique opportunity to step inside someone else’s story (literally). All from just cracking open a little book! The importance of reading doesn’t stop with raising a smarter child. Stories inspire creativity and a broadened imagination. They bring lands, characters, and plot lines to life that your child wouldn’t have experienced otherwise. Reading to and with your child sets them up for successful futures! They’ll develop critical thinking, logic, communication, and problem-solving skills. Regular reading advances a child beyond his or her school level, enriches vocabulary, and expands thought process. Remember that “do what I say, not what I do” crap you used to hear growing up? The fact is, your precious little one’s eyes are watching you, much more than their ears are listening! (It’s the truth!) So set a good example. Reading. Is. Important. Not only for them, but for you too! Reading a new book can help your cognitive function, as well. All of the language, communication, critical thinking, and logic-building skills that your little reader will develop, you can continue building, too. Make reading fun! 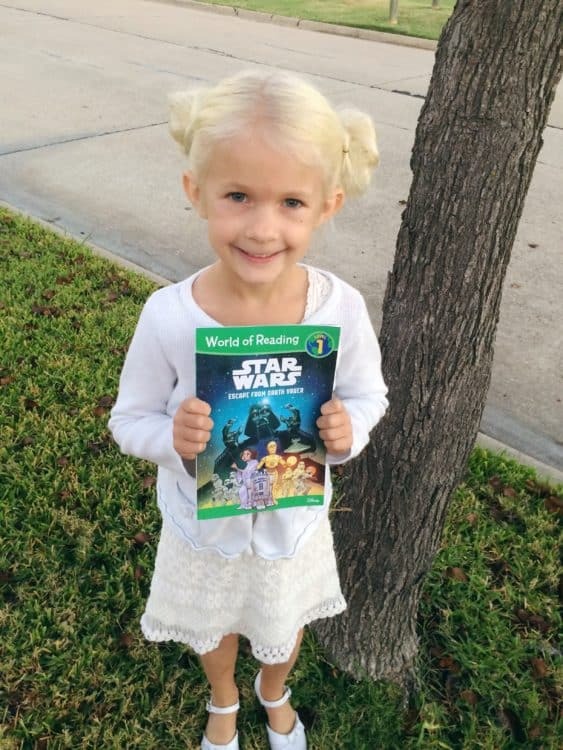 Encourage your little to read like it’s going out of style! Instead of saying “You have to read now;” opt for “Yay! It’s reading time.” When we frame it as something exciting and expected, there will be less whining or resistance. Offer them books that cover different events or occasions similar to what they are experiencing in their own life. Set aside time for everyone to read on their own. If it becomes a common practice, kids will come to expect it and enjoy it. Take time to read to them, too! Try designating certain times in the evening closer to bedtime, when you can share “Mommy-daughter” or “Mother and son” time by reading together. Our two households did a 25 Days of Christmas Books advent calendar one year. 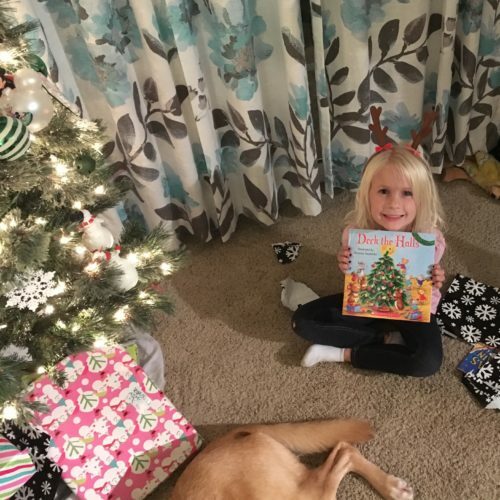 K received a Christmas or winter-themed book each of the first 25 days of December. She was excited to open her present each day – not just because it was a present, but also because she knew the gift contained a new story! We also take advantage of new experiences and life events to introduce new stories. Read how we use books for every occasion to sneak in reading time in a fantastically fun way! When you give your child fun books and make them available everywhere, it’s no longer a chore – it’s just a way of life! Stress to your child the importance of reading, but also the fun of it! You’ll be surprised how less often you hear your child say “I’m bored” because they’ve now discovered adventures in literature! We discovered Usborne Books in 2016 and COMPLETELY fell in love. This company just gets it. Their books are top-notch, cream of the crop – the lasting quality, the story lines, the variety of options. They’re everything you could ask for in children’s books! Usborne has books for all ages from newborn through high school age, nonfiction as well as fiction, from encyclopedias to activity books. One of our absolute favorite collections is the Shine-A-Light series. K owns 3 of them! If you shine a flashlight through the page, a hidden image appears, and you learn even more. How cool is that?! Usborne has books on coding, history, science experiments, mermaids… They tell stories about diggers, bugs, and dinosaurs. They offer encyclopedias and online resources for research! There are also books to help your child learn new languages, as well as wipe-clean books to teach them how to write, count, and tell time! There are Bible stories, nursery rhymes, and the cutest seasonal collections for any holiday. Every other mama we come in contact with who has heard of Usborne, is absolutely in love with what they offer. (We’re not kidding!) Even women with children grown and gone have raved about how they have loved Usborne from the time their kids were small. That’s how awesome these books are, mama! They last you a lifetime. Not only by staying in tact over the years (they’re especially perfect for little hands who like to rip things), but in the everlasting memories you’ll make with your child by reading them together! Because reading is so important when it comes to education (something Kandy Apple Mama fully supports) we thought it imperative that we find a way to provide wonderful mothers like you with these amazing books. So, we’ve partnered with the company to offer you the chance at purchasing them. If you need any help, please reach out to Kristen. She is especially gifted at helping families find new books. If you decide that there are just too many books on your wish list and can’t possibly afford them all, you can always host a party! You can sign up to host a completely online Facebook party – all you have to do is invite your friends online! Party hosts receive free and half price books as rewards. Hosting a party doesn’t cost a thing, gives you an excuse to catch up with old friends, and you get FREE, fun books for your kiddo! What better way to start this new journey of reframing reading as an adventure instead of a chore and a bore? For more info on hosting, sign up in the popup or visit Kristen’s site here. Another way you can earn free and reduced price Usborne books is by signing up to be a consultant, yourself! By joining Kristen’s Usborne team, you can order books for your own kids at cost – a 25% discount! You can also earn money by selling books to others, and earning that 25% for you and your family (although it’s not required)! For more information on joining our Usborne books team, contact Kristen through the page popup, or visit the Join Usborne page here. The Kandy Apple Mama team loves to read, and we hope you and your littles will too! Even if it’s not your favorite guilty pleasure like it is ours, you can still use Usborne books to instill a love of reading in your child. This will not only help them throughout grade school, but also in college, in their future career, and throughout their adult lives! Set your child up for success by making reading fun, and treating books like a reward. And if you aren’t fully convinced Usborne is the best, (we know it is!) taking your littles to the library is always a fantastic second choice! Why are Usborne books better than other book stores? Not only are the materials Usborne uses higher quality and therefore more durable, but the stories and book contents are unique as well. New fiction stories, old stories renewed, and even non-fiction options are available. Check out the books for yourself by perusing our online storefront here, or by hosting a Facebook party with us! If I host a party, do I have to buy something? Nope! Purchasing items yourself is not required. But if your party guests end up making purchases themselves, you as the host have the potential to earn hundreds of dollars worth of free books for your little one! Do I have to make a minimum purchase? Absolutely not! When purchasing from Usborne books, there is no minimum purchase amount. That being said, sometimes a party consultant will offer free or reduced price shipping rewards as a party raffle prize. To use these prizes, they often require a minimum purchase amount. This is something you’ll have to talk to your party host or Usborne consultant about. Does Usborne only sell books? Actually, no! (Hence the “Usborne Books and More” company name.) Usborne also offers coloring books and activity packs, flash cards, games and puzzles, “learning palettes“, stickers, and more! Check out all they have to offer here. Does signing up make me a distributor? Depends on what you mean by “signing up”. Signing up to be a host does not mean you are a distributor. It means you’re hosting a party to share Usborne products with your friends and family! Signing up as a consultant for Usborne would make you a distributor, which would allow you to earn 25% of sales. And what’s even cooler about being a consultant, is that you don’t have to have an inventory to sell product! Welcome to the digital age of online retail, mama! What do Usborne distributors earn? PLUS, you get the opportunity to make a difference in the lives of others by encouraging a love of reading, friendships, personal growth and development, plus so much MORE! If I'm a distributor do I have to make a minimum purchase each month? No! This business is flexible and family-friendly. There are NO monthly quotas you have to reach. You’re free to work your business at your own pace! Of course, Usborne Books & More does offer additional bonuses and awards each month with minimum sales, but it’s certainly not a requirement!